However, this can be reversed with machine settings. 436. Tecnitium Pyrophophate: binds to myocardial infarct and so it looks hot on nuclear scan. 421. For lung investigation - CT scan is best, except in Pancoast tumour/Superior sulcus tumour where MRI is investigation of choice to look for brachial plexus involvement. Barium studies have doses close to CT head, except Barium enema which has dose just less than CT chest. --> HRCT is also used in temporal bone imaging. 427. All fractures are well visualized on CT except stress fracture which is best seen on MRI due to edema. 428. MRI uses free induction decay to receive signals. 430. CSF is white on T2 weighted image and dark on T1 weighted image. 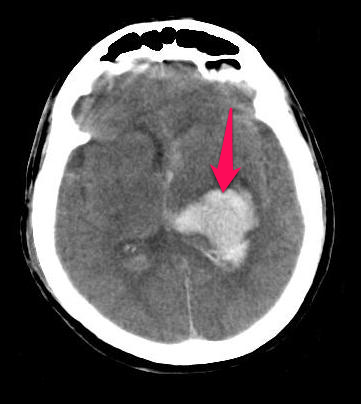 First investigation to be undertaken is CT scan, to rule out haemorrhage. 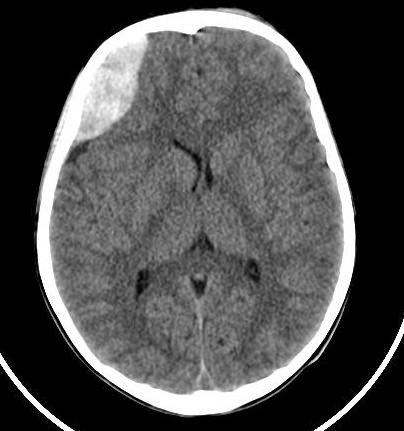 It is thus the investigation of choice for haemorrhagic stroke. Red - loss of insular ribbon and grey-white matter differentiation; green - normal insular ribbon, blue - normal deep grey matter. Later, even CT can demonstrate the infarcted area very well as wedge shaped hypodensity in the particular vascular territory. It is the investigation of choice for ischaemic stroke. 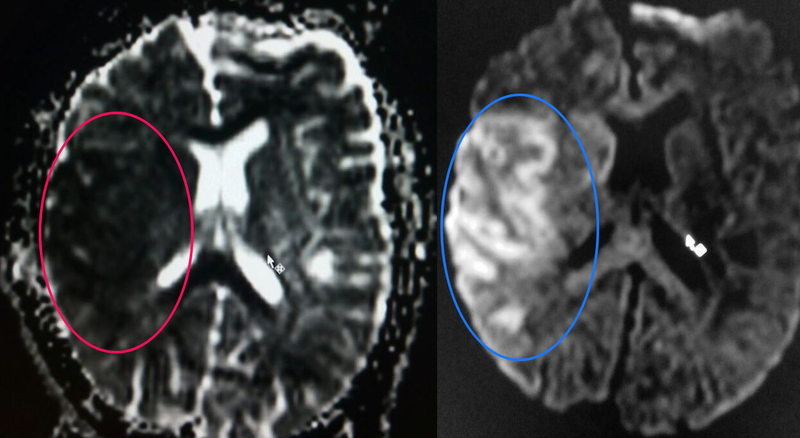 Diffusion weighted MR imaging is the earliest to detect ischaemic region as hyperintense on DWI and hypointense on ADC maps. 415. 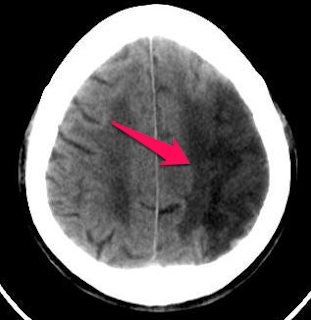 Basal exudates on CT seen in: Tuberculous meningitis and cryptococcal meningitis. 416. Contrast of X-ray image is inversely related to kVp. 417. Radiation intensity is inversely proportional to square of distance from the radiation. 418. Chest X-ray PA view is taken with film to focus distance of 180 cm. Chest AP view and other X-rays are taken at 100 cm. 419. Golden S sign: Right upper lobe collapse due to hilar mass. It refers to a state in which there is wall dysfunction but the perfusion (resting and stress) is normal. 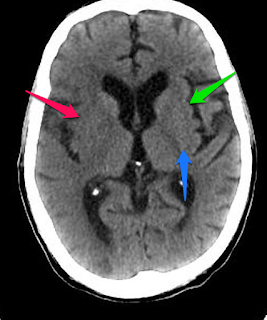 It refers to a state in which there is decreased perfusion on stress but normal during rest (seen as reversible perfusion defect). These patients will significantly benefit with treatment. In this the myocardium shows decreased perfusion on both stress and resting phase (seen as fixed defect) but the myocytes are viable and will benefit from revascularization. In this there is absent perfusion on both stress and resting phase (seen as fixed defect) and the myocytes are not viable. There will be no benefit from revascularization. This article was exported to Radiopaedia.org on 24th May 2015 by the author. Q. What is the diagnosis ? To Search for a "particular word" on "the page on your screen" , press Ctrl + F and then type the word you need to search on the visible page. eg: If you need to search the word "Anatomy" on this page -- Press "Ctrl + F" , (a box will appear) and then type Anatomy in the box that has appeared. Coarctation with anomalous post-coarctation origin of the right subclavian artery. Follow Ayush's board Radiology Spotters on Pinterest. The information on this site/blog is not intended or implied to be a substitute for professional medical advice, diagnosis or treatment. All content, including text, graphics, images and information, contained on or available through this site/blog is for medical education only. While the goal of this site/blog is to provide complete, correct and accurate information, none of the authors/contributors can be made responsible for any incompleteness, incorrectness and inaccuracy. If you are a patient, please see your doctor for evaluation of your individual case. Under no circumstances will the authors be liable to you for any direct or indirect damages arising in connecting with the use of this site/blog. This is a Non-profit blog/site intended to make medical education simple and easy for the medical professionals. If someone finds his/her copyrighted content published on this site/blog and wants it to be removed, please CONTACT US and tell in detail about what material should be removed/credited to, along with DETAILS of your webpage/source from which it has been taken and your copyright authority over the material. "The medical information might change in future because of the advancing science and controversial aspects. So it is requested that if you find any change, please comment on it with the new information." This site is Best viewed in Google Chrome. Copyrights © MedicoNotebook - All rights reserved. Designed by DrAyushGoel. Powered by Blogger.